Thank you to Macmillan for sending me an ARC of this book! I don’t tend to DNF books that often, and I certainly don’t tend to write reviews for these books a lot. The reason why I’m making an exception today is because 1) I got this book for review, and even though I’m sending it to another blogger that will hopefully be able to write a full review on it, I’d feel guilty not reviewing it at all, and 2) I feel like I’ve read enough of the book to talk about it for a little while. Just, keep in mind that I haven’t read the full book, so this review can be taken with a grain of salt. The reason why I don’t tend to DNF books that often is because I’m a curious person, and almost all books either have characters that I like and I’ll want to know what happens to them, or a plot that intrigues me (even if it’s only a little) and I’ll (again) want to know what happens at the end. This book had neither of those things. 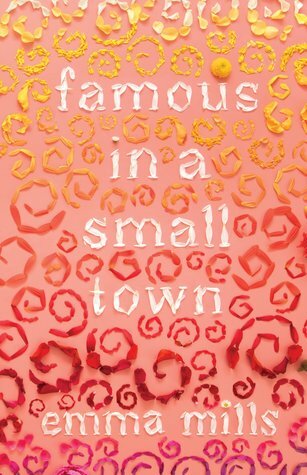 Famous in a Small Town very much felt like a slice of life book. We follow a group of teenagers moving through life in their small town, and the overarching plot is mostly about them trying to get this country star which is originally from their small town to come back and help them with their fundraiser. I think the book certainly did this ‘slice-of-life’-aspect well, but it’s just something that doesn’t work for me personally. Like I said in the previous paragraph, I need something that intrigues me to keep reading, and slice of life books often don’t give me that. I also didn’t really care about the characters in general, because this book did a thing that’s a giant pet peeve for me: they introduced a lot of characters at once. I’m not that great with names, so if you introduce 10+ characters in the first few chapters I’m just not going to remember who they are. And it’s quite hard to care about characters when you keep mixing them up, or just keep forgetting who exactly they were. And, to be totally honest, this started to frustrate me a lot. Other than this, the book was fine. The writing was pretty good, fast-paced and easy to get into. The setting was cute. I liked the friendships and the budding romance. Maybe I would’ve started to like this book a lot more if I kept reading, but hey, I have way too many books on my TBR to spend hours on a book that I don’t like and that frustrates me, just because it might get better. So while I didn’t personally like the book, I know that many people are probably going to like it. In fact, looking at Goodreads, it looks like a few people already did! And I, for one, am definitely still going to try out other Emma Mills books. I already have two sitting on my shelves and I’ve heard great things about them, so I’m excited. I agree about the names, especially if they start with the same letter. it’s so confusing!!! i hope your next read is better!!! AH I’m so glad to hear I’m not alone in this!! And I’ve read a couple of great reads since DNF’ing this book, thank you! I’m so glad to see your review, because a friend and I buddy read Famous earlier this month and were both super unimpressed. Be glad you stopped reading when you did, because there’s a “plot twist” about 75% into the book that felt really cheap and unnecessary. I normally love Emma Mills, and for the first 100 pages or so I was all in on this one, but it went downhill fast. Oh, I’m so glad I wasn’t alone in this! But I have to say I’m a little bit curious about what the plot twist was… I’m glad to hear that you normally love Emma Mills though, because I’ve been kind of dreading to read the Emma Mills books that I still have on my TBR. This makes me a little less scared of them. That’s super relatable! I don’t read a lot of fantasy anymore, but I always messed up the names whenever I did read one. It was super frustrating.